By Avt. Ananda Giitika Ac. In defiance of material constraints common to East African schools, the Ananda Marga Academy of Kiembeni, Mombasa, has been offering art experiences to upper primary pupils of Class Five, a class having 54 children. Whereas in other upper classes, art takes place in an impromptu manner, e.g. the teacher giving an idea and the children sketching in their drawing exercise books, in Class Five a volunteer art teacher named Sima pre-plans each class. Throughout the year, the pupils in Class Five have access to materials—rare in East African schools!—such as scissors, different types of papers, crayons, temperas, charcoal for drawing, glue, glitter and clay. 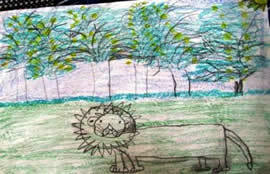 Due to Sima‘s work, new art ideas have been generated and taken up by other teachers, especially in the lower primary. 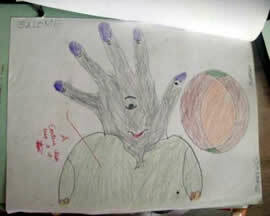 There is also a budding interest in art growing in other Ananda Marga schools in the slum areas of Nairobi. 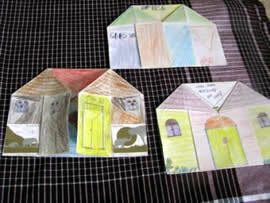 Design a Hotel—use of simple origami to fold the hotel, and design using coloured pencils. The inside of the hotel is also designed. Following directions in paper folding; use of imagination in designing the hotel; use of colour to enhance design. Focus in following directions; difficulty in getting perspective when making furniture for the hotel. Outcomes: Appreciation for the differences in ideas among the pupils, and satisfaction in the achievement of one‘s own design. Exploring the concept of tourism. Nowadays, tourists come from the same country as well as overseas. Imagining countries, clothing, etc. Make a mask—using paper plates and pre-cut shapes. Cutting; pasting; tying. 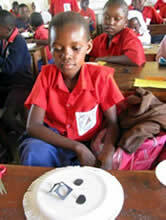 It can be challenging if the children lack experience with basic skills. The fun of trying on a mask. 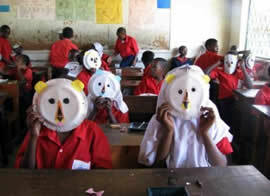 Use of masks in dramas; carved masks in traditional Africa. Make an underwater seascape (or waterfall). 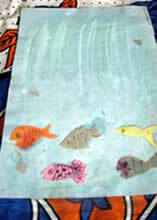 Paint an underwater background; stick pre-cut tropical fish (from shiny papers), finish with seaweeds, starfish, etc. Use of watercolor paints and brushes, exploring the effects of different strokes in painting. Exercise in balance and design in sticking fishes. Finishing with one‘s own ideas. The challenge of not overdoing the painting and the same with the finishing. 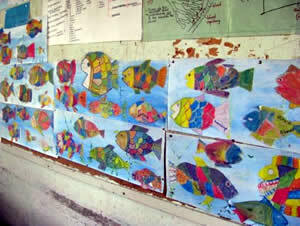 Many children have to learn =when to stop.‘ While waiting for the paint to dry, children can trace and cut out more fishes. Outcome, the seascapes can be laminated and used for greeting cards. Imagining an undersea world. Talking about types of fish in the area. Make a Paper Mache vase, to be painted in another class. A recycled cardboard toilet paper tube fitted with a base is used. African motifs may be used in the final painting of the vase. The skills in using flour based paste and newsprint strips for paper mache. Painting skills. 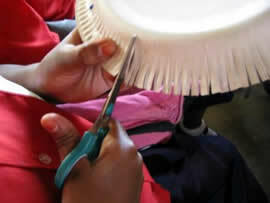 Paper mache can be challenging, although with guidance, the pupils ‘get into it.’ Cleaning up also needs to be organized. Expanding the children‘s knowledge about traditional African pottery and motifs. 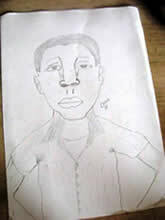 » Trace one‘s hand, and use it for making any picture one likes» Learn how to draw a face – the basic proportions of the face – and then draw one‘s desk mate (or teacher! 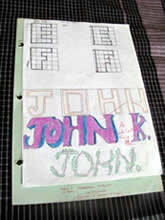 )» Design one‘s own fish in crayon, and draw sections in the fish, and paint over in three colours. Make a school of class fish on the bulletin board» Make a butterfly book—the shape of a butterfly– writing one‘s own ‘butterfly story’ inside» Block printing one‘s name.» Express oneself with montage, letting the outcome reflect one‘s views, and tell the class.» Use clay to express one‘s feelings» Cut out geometrical shapes and design one‘s dream home. can represent a major investment for many schools. Although there is a cultural value in honesty, there is also the prevalence of ‘borrowing’. In fact, in the Kiswahili language, the word borrow is phrased as “help me with ..” (your pencil), and the person who doesn‘t help is considered rude. Therefore, during art class, some pupils often snitch materials such as scissors, rubbers, colored pencils, and so on without a second thought. It is therefore incumbent to make arrangements to safeguard the materials. Sima assisted our school in devising systems to make sure that materials were returned to their boxes. A simple count before and after the class, involving pupils in collecting and counting, and appropriate storage and rewards for good class behaviour made it possible to train the Class Fives to return all the supplies, which were then kept in the office. Other teachers have followed the same system; as a result that art with varied materials has been made possible for more children. Children appreciate the opportunity to be creative, and studies show that it makes a difference in their academic performance. General knowledge is greatly enhanced, but we believe the most essential motive for starting an art programme at school is the great sense of satisfaction it gives to the pupils and the development of their aesthetic sense, a regeneration of the great African value of beauty and art.